These two do indeed appear in the main series, and bring the awesome. Erin: Ooh, we’ve got a double-header here… Well, sure, I can answer two questions at once. Email: One: How come you spell Integra’s name with an “L” at the end but also the standard way w/o the “L”, and Two: when are Yumiko/Yumie and Heinkel introduced in the manga? or it could be something like “Farbrook”, but the accepted romanization is “Fairbrook”. In the anime they drop the “Fairbrook”, as you can see on this scan from the CD. And in both the anime and manga it gets shortened to just “Sir Integra.” (Gee, I wonder why.) 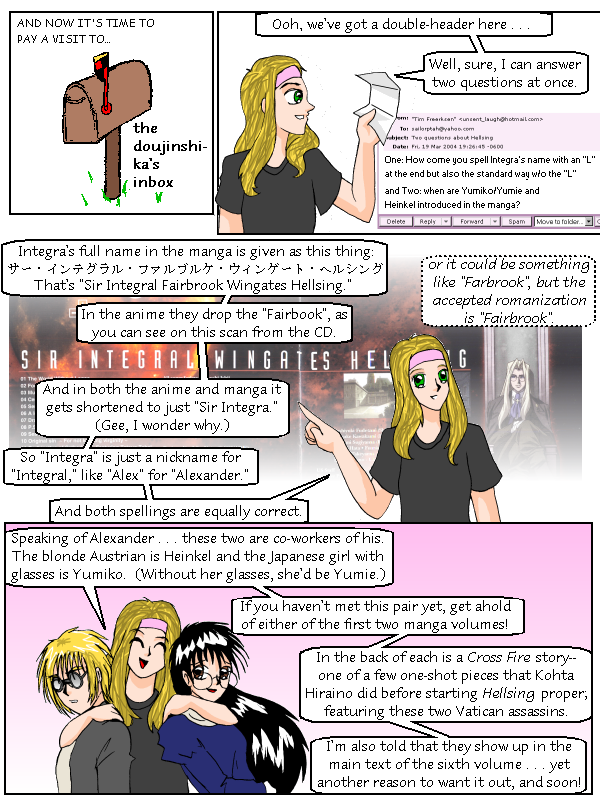 So “Integra” is just a nickname for “Integral”, like “Alex” for “Alexander.” And both spellings are equally correct. If you haven’t met this pair, get ahold of either of the first two manga volumes! In the back of each is a Cross Fire story— one of a few one-shot pieces that Kohta Hiraino did before starting Hellsing proper, featuring these two Vatican assassins. I’m also told that they show up in the main text of the sixth volume… yet another reason to want it out, and soon!